A very happy Monday to you, I’m delighted you’re spending a little time with me again today. We have another easy heart-based tangle for you to enjoy exploring. Shearts is from Arizona tangler Mary Van Deman and I’ve been saving her swirly heart tangle for the Valentine’s “season”. I am new to tangling and this is my first submission to TanglePatterns.com. It came to me as I was looking for a way to make a stylized iris for another project. The center petals of the iris seem to me to resemble a heart, so the heart shape is the basic element of this design. I like it because it is really simple to draw, but can be expanded into a more complex pattern by lining or stacking the shapes. I have lived in the Phoenix, AZ area for many years and began painting in watercolor in 1989, later switching to oil. One day last spring while on a home tour with my friend, Katie, we came across a home decorated with tangles. Neither of us had seen anything like it before and we both loved the art. Katie wanted to jump right in to learn how to do it and wanted me to join her. “No,” I said, “I’m too busy with oil painting and don’t want to be distracted.” But I volunteered to search Amazon for a book for her and came across “Zentangle Art Therapy – Meditative drawing to reduce stress, increase wellbeing and enhance relaxation” by CZT Anya Lothrop. I was intrigued. I clicked the “Buy it now” button and I’ve been a bit distracted ever since. I soon found your website and I purchased Zentangle Primer, Vol. 1 by Rick Roberts & Maria Thomas, learning so much from their wonderful book that I now alternate between tangling and oil painting. I do tangle in black and white, but because I can’t leave color alone I’ve also developed a method of combining alcohol ink pours with tangles for ZIA’s. You will find them on my website at www.MaryVanDemanFineArt.com under Works>Abstract. Tangling relaxes me and feeds my creativity and I love it! I am now beginning to see patterns everywhere I look and am starting to design them when I’m supposed to be sleeping. I have named my new tangle pattern Shearts. In the first tile that I included to illustrate Shearts I have placed the Shearts in a line across the tile upside down and right side up. I added the tangles Hollibaugh, Vega, and ‘Nzeppel to completed the design. In my second tile I have stacked the Shearts, combined them with Fife and Crescent Moon, and added some lines and perfs in the upper left section to send the eye back toward the stack of Shearts. After completing the first two samples I used my Shearts pattern on an alcohol ink pour. The pour serves as a string to guide my tangle design, but I added no additional tangles to this ZIA. I used a brown Sakura pen on this one because there was so much brown in the pour. Shearts is a simple motif comprised of curves, inner and outer auras and a couple of Fescu-tendrils. 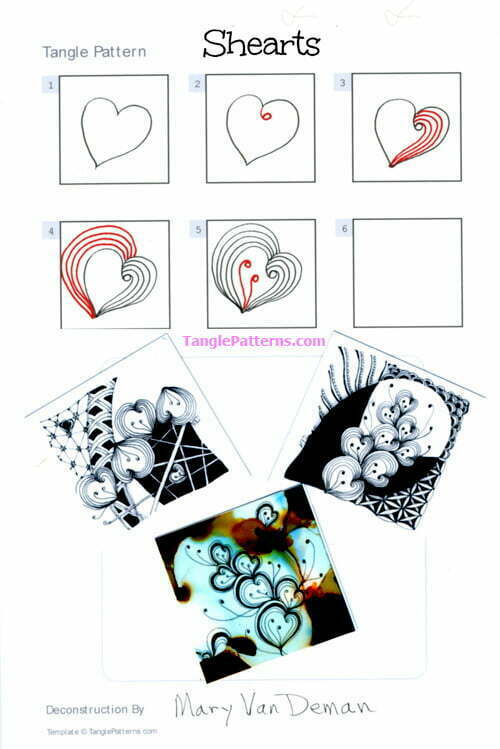 And as Mary points out, you can combine them in a variety of ways to fill a section of your Zentangle tile. I used a “vining” look for my example, similar to two of Mary’s tiles below. Mary illustrates the step-by-step instructions for drawing Shearts below along with her sample tiles. Check out the tag maryvd for more of Mary’s tangles on TanglePatterns.com. Lovely story and sweet tangle..
What a nice new tangle pattern for Valentine’s Day! Thank you, Mary. so enjoyable! thanks so much! Very nice and just in time for Valentines day. Was für ein wunderschönes Valentins-Muster. Danke dafür !! Google Translate: What a beautiful Valentine’s pattern. Thanks for that !! Thanks for another fun heart. Truly a beautiful and fun tangle. Everybody loves a heart pattern; no matter what size, design they come in. Right? Love this one. Thank you.